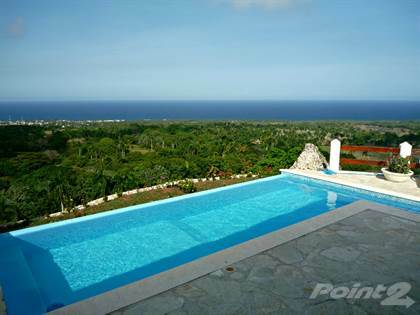 This gorgeous villa is nestled in the hills of some of the most incredible land you will find here in the North Coast. It has a fully equipped kitchen and dining area, a living area, 6 generously sized bedrooms, 6 full sized bathrooms plus 2 powder rooms, and a large classic infinity edged pool. Ceiling fans in every room and all bedrooms are equipped with an AC split unit and a flat screen TV. The over sized patio has plenty of living space including areas for dining, sitting and relaxing. Perfect for entertaining guests! All of the exquisite decorating is in complete harmony with this special location. You get all of this plus the incredible panaromic views of the ocean from almost anywhere in the house. This house is a MUST SEE!!! Hi, I'd like to find out more information about Villa Mountain Dream, incredible panaromic view, 6 bedrooms, 6 bathrooms. Thanks so much!